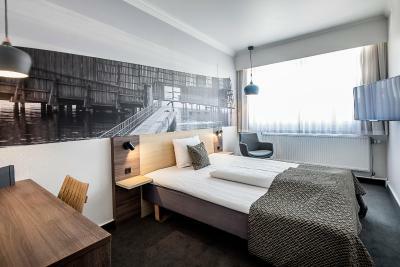 The location to the airport and the inclusion of transportation from the shuttle bus made this option of hotels more appealing than others in the area. It is very close to the airport at a good price. 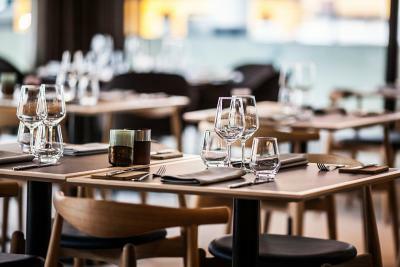 It is nice and clean and the restaurant is wonderful. It's walking distance away from the airport. Its in a quite and safe neighborhood. The place for a single woman traveling alone makes you feel safe and comfortable. The staff is always cheerful and positive even when you feel so tired and off from your travels. This was my second time being at this hotel and I like staying here. 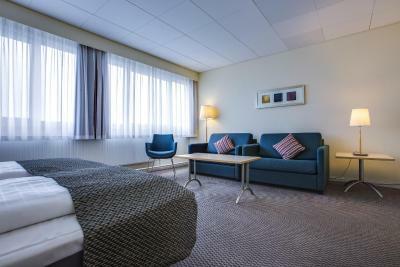 The hotel is at walking distance from Kastrup Metro Station, easy to and from airport. In front of the hotel there´s a 24hrs convenience store and a Chinese restaurant which is quite delicious. Reception staff who made check in for me. She was very nice and kind. Very friendly staff, if you have a morning or evening flight the airport shuttle takes a bit of the sting off of the price. The room was a good size and clean. Front desk staff was courteous, friendly and anxious to assist with every need. The hotel was very clean and well furnished. 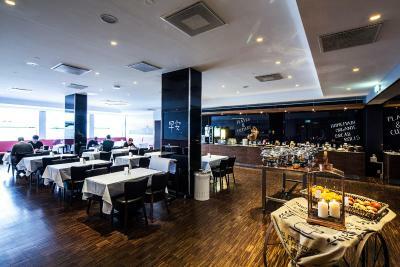 Bar and restaurant on site, free breakfast, free airport shuttle. The rooms were large, clean and the beds comfortable. Close proximity to the airport was a key for our choice. Free luggage storage. This Hotel was very clean and the location to airport great with no charge drop off. Loved walking around the neighbor hood and restaurant next door was and extra added plus. Excellent service, very kid friendly! 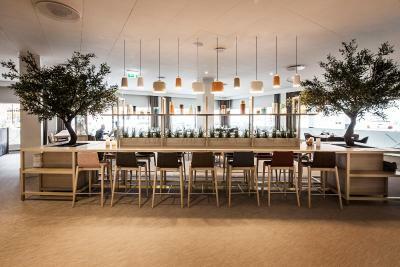 A perfect place to spend the night before flying out of Kastrup Airport. Great shuttle service too. 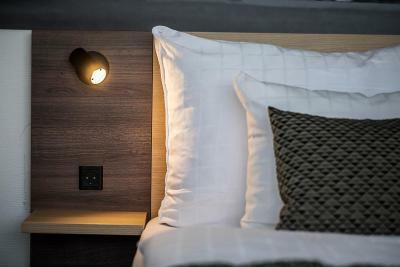 Quality Airport Hotel Dan This rating is a reflection of how the property compares to the industry standard when it comes to price, facilities and services available. It's based on a self-evaluation by the property. Use this rating to help choose your stay! 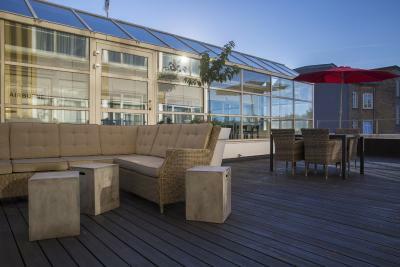 This hotel features a free Copenhagen Airport shuttle every half hour from 6 am - 9:45 am and 6 pm - 9:45 pm. 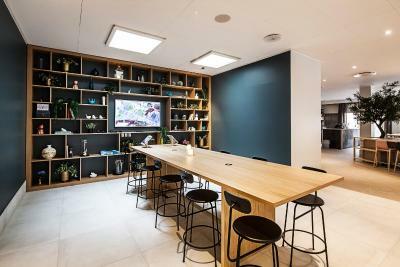 Wi-Fi and fitness room access are also free. Central Copenhagen is within 4 miles of the property. 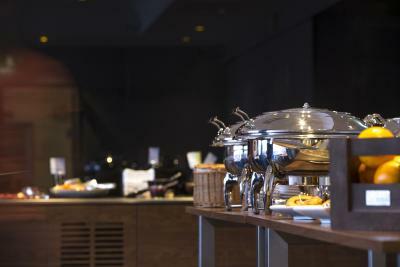 A daily buffet breakfast includes organic options, and a grab-and-go breakfast is also available. 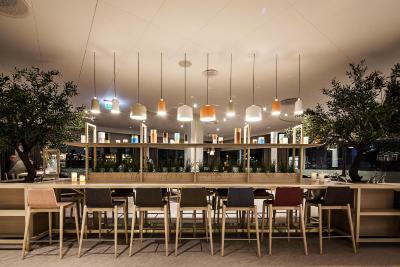 In the evening, the brasserie-style restaurant serves dishes made from fresh, seasonal ingredients. The cozy lobby bar is open for evening drinks. 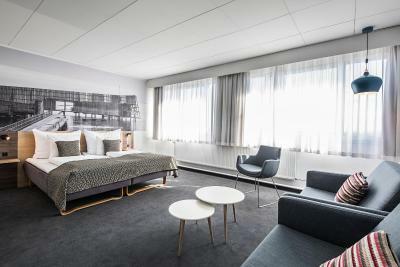 Amager Beach Park, Den Blå Planet Aquarium and Kastrup Metro Station are within a 10-minute walk of Quality Airport Hotel Dan. Field's Shopping Center is a 20-minute bus and metro ride away. When would you like to stay at Quality Airport Hotel Dan? 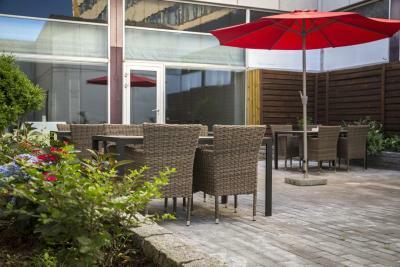 Private parking is available on site (reservation is not possible) and costs DKK 85 per day. Spacious room with a seating area and flat-screen TV. 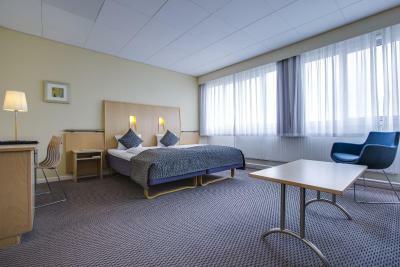 Close to Copenhagen Airport is where you are, when you stay at Quality Airport Hotel Dan. 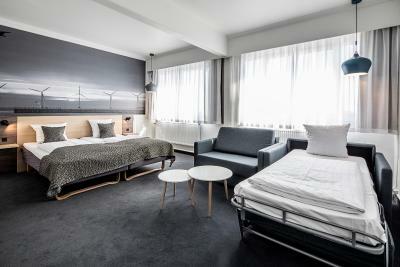 The hotel is one of the few hotels in Copenhagen that provides a complimentary airport shuttle service to the hotel. 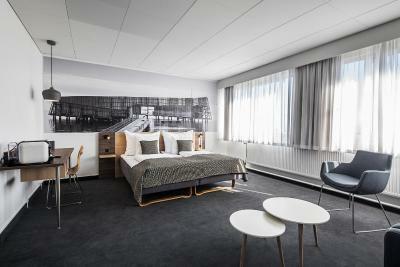 You will feel the international vibe when you walk into the Quality Airport Hotel Dan. 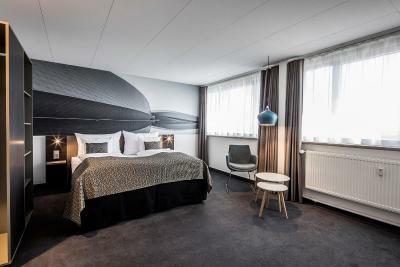 The hotel offers a good night's sleep close to Copenhagen Airport and also with a complimentary shuttle service between the airport and the hotel. 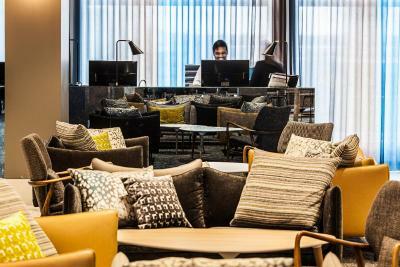 House Rules Quality Airport Hotel Dan takes special requests – add in the next step! The shower was very difficult to control the temperature. The staff kindly helped to manage it so I appreciated it, but still the control was very sensitive and hard. Kind staff, reasonable price, spacious room. The shuttle service is good. Rubbish bins will be emptied at 5am and it’s very noisy process. Don’t ask room on back of the hotel. Very fast check in. Room has “sea view”... if you know where to look. Shuttle stops at 10, my flight landed after. Had to make my own bed! The staff was most non cooperative. The worst that I have on my current trip. Sorry about it. Our lock had some issues, but that was resolved quickly. Thr bed was comfortable, and room clean. Free transfer to airport. Room needs renovation, carpet was very old and dirty, water from shower leaks all over the bathroom floor. I found the female receptionist very unwelcoming on arrival (although there was a young male who was at the desk last night and he was good). I felt for the price, there should have been complimentary water/shower cap etc at the very least and I was shocked to find there was no kettle in the room and that I had I go down and pay for a plastic, lukewarm cup of coffee. The fact that breakfast wasn’t even included also amazed me. Overall we were both dissatisfied with our stay and will not be recommending your hotel. I wish that the shuttle operated during more hours. I consistently get overcharged for a taxi ride to the airport. Sometime by double. The meters in the taxis are not to be trusted especially if you aren’t speaking Danish. I suggest walking or the shuttle and a taxi only as a last resort or ask about price before getting in. A bit too extensive since breakfast was not included. 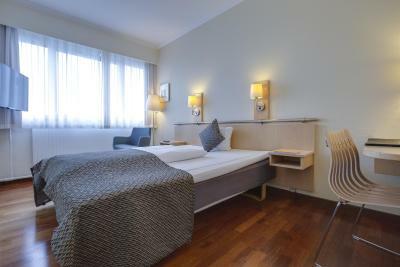 Simple room, though okay to stay one night in.. Nice with free shuttle to the AirPort. The shower is inside bathtub. Quite small room and bathroom, looking a bit old. I don't like carpets.